Have you ever noticed that some food—homemade cookies, for example—smells terrific, while other food—like fish—makes you want to hold your nose? What causes those stinky smells and why do we eat odorous food? Most off smells are caused by chemicals in the food. Fish smells because it is full of the chemical trimethylamine, which can also cause bad breath in humans. Most animals make this chemical, but fish produce it by the scads. Why? It helps them maintain a lower body temperature without freezing. Beans contain sugars that our bodies aren’t able to break down very well. These sugars pass through the small intestines completely undigested. When they reach the large intestines, bacteria attack the sugars, making methane and sulfur in the process. Which is why they’re called the musical fruit. Ever noticed that asparagus makes your pee smell funny? That smell is caused by asparagusic acid—only found in asparagus—which causes a sulfur-like smell. Cheese is milk that’s been heated and fermented until it’s thick. Some cheese, like goat cheese or fresh mozzarella, has a mild odor and flavor. Other cheese, such as blue cheese, is aged differently and has a stronger taste and smell. And then there are the really stinky cheeses. These cheeses have actually been washed in a mixture that contains the same bacteria found in sweat! Their smell ranges from sweaty gym socks to fish in a trashcan. One of the smelliest cheeses, Epoisses, was banned from France’s public transit system. In other words, in a country where people love cheese and use the train to get almost everywhere, this cheese is so bad that it absolutely cannot be taken on the train. Cheese lovers claim that these stinky cheeses rarely taste like they smell and that most of them are quite delicious. Question: Why did people originally taste disgusting smelling food? Answer: Hunger is the likely answer. Before grocery stores and supermarkets, people had to forage, hunt, or grow their food. When food was scarce, they probably became less picky about what they ate. Read more about stinky cheese. Declan, Tobin. " Facts for Kids about Weird Food Smells ." Easy Science for Kids, Apr 2019. Web. 23 Apr 2019. 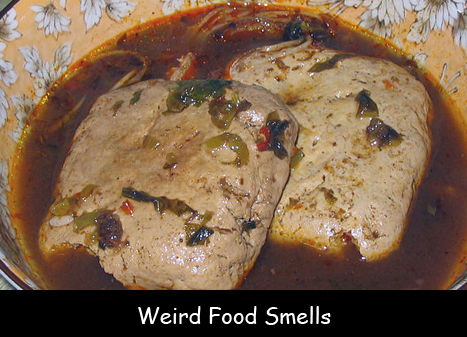 < https://easyscienceforkids.com/weird-food-smells/ >.